A task can be handled in several ways when the computer enters an idle state. This includes defining an idle trigger or setting the idle conditions for when the task starts. In Windows 7, Task Scheduler considers a processor as idle even when low priority threads (thread priority < normal) execute. In Windows 7, when the Task Scheduler detects that the computer is idle, the service waits only for user input to mark the end of the idle state. When any of the events above happens, Task Scheduler tests the computer for idleness since the last verification time. In practice, this means that Task Scheduler may declare the system as idle immediately after user absence is detected, if the other conditions have been met since the last verification time. In Windows 8, the CPU and IO thresholds are set to 80%. When detecting the idle state in Windows 8 Server, Task Scheduler does not take user presence or absence into account. To mark the end of the idle state, Task Scheduler revises the resource consumption once in 90 minutes. A task can be started when the computer enters an idle state by defining an idle trigger. An idle trigger will only trigger a task action if the computer enters an idle state after the start boundary of the trigger. An application can define an idle trigger by using the IIdleTrigger interface. If reading or writing XML, the idle trigger is specified by the IdleTrigger element of the Task Scheduler schema. The task settings can be used to define how the Task Scheduler handles the task when the computer enters an idle state. The following illustrations provide three possible timelines that show how these different idle conditions relate to each other. 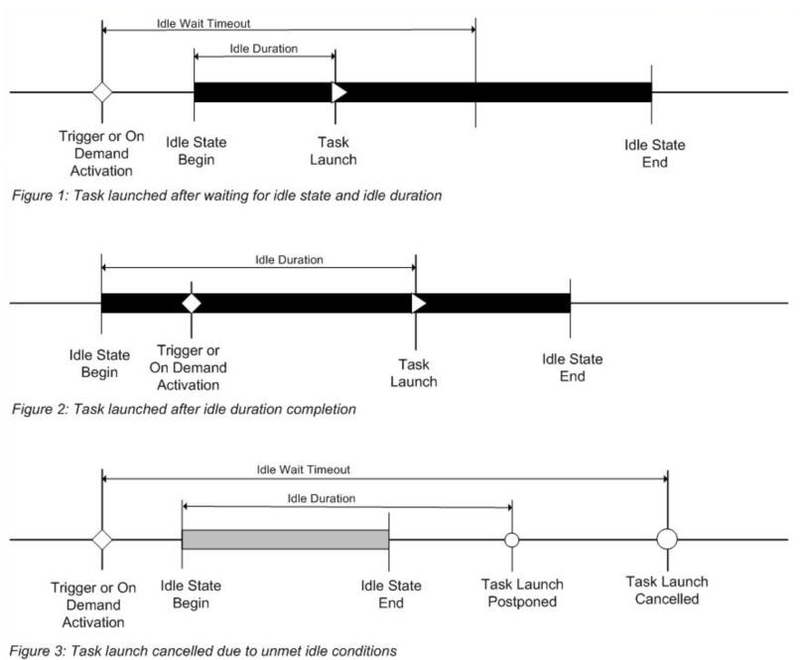 Be aware that the illustrations start when the task trigger is activated or when the task is started on demand (without requesting to ignore the existing task constraints). Idle Wait: The amount of time that the Task Scheduler will wait for an idle state to occur after a task trigger is activated or after the task is started on demand. Idle Duration: The amount of time you want the computer to have been idle before starting the task. Idle Start: The time when the computer enters an idle state. Idle End: The time when the computer goes out of the idle state. Be aware that the amount of time the computer is in the idle state is independent of the idle duration time that was described previously. For example, if a task is set to start only if the computer is idle for 30 minutes, and the task waits for the computer to be idle for 10 minutes, then the task will launch in 5 minutes only if the computer has been idle for 25 minutes prior to the time the trigger was activated. The task will not start if the computer enters an idle state 5 minutes after the trigger is activated. By default, a task DisallowStartIfOnBatteries property is set to true, which means the Task Scheduler service will not run tasks that are triggered by an idle trigger (or a trigger with idle conditions) when a computer is running on battery power. You can change this behavior by setting the DisallowStartIfOnBatteries property to false. If a task is triggered by an idle trigger, then the WaitTimeout property of the IIdleSettings interface (IdleSettings for scripting) is ignored. Applications can control the idle conditions by setting the properties in the IIdleSettings and IIdleTrigger interfaces. If reading or writing XML, these conditions are specified in the Settings element of the Task Scheduler schema. To terminate the task when the idle condition ends, set the StopOnIdleEnd property or the StopOnIdleEnd element to True. To restart the task when the computer cycles into the idle condition again, set the RestartOnIdle property or the RestartOnIdle element to True.